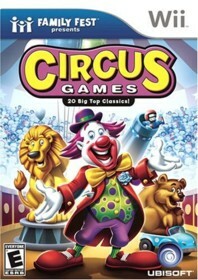 Family Fest Presents Circus Games is a Wii game in the Action genre. The game was published by Ubisoft and developed by Kuju Entertainment. The game has an ESRB Rating of E (Everyone 6+) and was released on 2008-10-21. The game's official site can be found at www.ubi.com/ENCA/Games/Info.aspx?pId=7174. DO NOT RENT OR BUY THIS "GAME"
This has to be the absolute worst title my family or I have ever played in my life. Everything from the graphics, sound to the controls are just absolutely terrible...I would say it is not even worth a penny! The actual mini games are also very bad and not even fun...no one would play this game ever and I had a hard time to convince anyone to try it for more than 20 seconds. Please pass on this game.